Having a succulent wall garden in the form of living wall art adds style and elegance to your interior space. It shows your appreciation for natural beauty in your decor. It is not only trendy and great to look at but it is beneficial for your lungs and overall health. It is a scientific fact that certain foliage and flowers make effective natural air cleaners, ridding the air of harmful toxins. When it comes to your indoor space, you can make a statement about your value for life and freshness in the home. When incorporated into our homes and offices, it can liven things up, add visual interest and relieve stress. This type of art definitely makes a positive impact on the employees in the workplace because it is alive! The air is refreshed when the plants extract carbon dioxide and and exchange it with oxygen. With cleaner air and increased oxygen levels, employees are more alert causing them to be more productive and happier. As a decorative option, you can add a succulent wall garden to your interior relatively easy with succulent plants. Plants such as echivera known as “hen and chicks” form low-growing clusters of rosettes. With colors such as green, red, purple, and yellow artfully arranged, you can display a beautiful showcase year-round. These rosettes have foliage which may have hairy or smooth textures. The leaves may be spoon-shaped, bronze or bluish grey in color with translucent edges. These types of plants shown in frames definitely bring drama and interest into your home or office when displayed on your wall. These unique, artistic plants are ideal because they are easy-care plants that need minimum care. They are drought-tolerant, which means they store water in their leaves and stems. With this ability, they require a minimum of water and fertilizer and rarely have pests. Perfect for the busy or neglectful gardener--allowing you to have living art that is virtually worry-free. With a frame, some potting mix, and your choice of plants, you can create your own living wall art. The frame must be covered with a water-proof backing board and mesh. Plant cuttings are pushed through the mesh to be rooted into the soil. You can even purchase the all-in-one kit with the wall mount brackets for hanging. However, you must provide your own plants. Light: place your plants in an area where they can receive a minimum of six hours of bright indirect light. Filtered light from a south, east, or west window is ideal. Avoid direct sunlight because Echeveria can be scorched which can lead to an unattractive, bleached-out appearance. Where light is insufficient, you can supplement with artificial grow lights. They are equipped with timers to turn the light on and off during the day and night. Water: Always be mindful and never overwater as this will cause root rot and kill your plant. Check to see if your plants are nearing dryness by using your finger to feel the soil. If it feels on the dry side, the plants will need watering. Water them lightly and allow the water to drain off. Water plants sparingly during the dormant periods. Use just enough water to keep the roots alive and never allow them to become dehydrated and shrivel up. 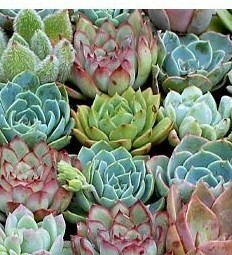 Temperature: Keep Echeveria succulents in temperatures between 50 to 55 degrees Fahrenheit at night and 65 to 70 degrees Fahrenheit during the day. Grooming: As plants grow cut off flower stalks and the blooms and remove dead leaves from the bottom of the plant. This helps to keep them attractive and rids pockets that may become a habitat for pests and fungus. You will discover a succulent wall garden is great living wall art. In addition to the eye-catching beauty of this green wall, you will have all the benefits of nature indoors. The air will be cleaner and you will experience overall health and well-being.